GOODGOD Small Club ~ THE HOUSE OF WHO: ANZAC EVE PARTY! THE HOUSE OF WHO: ANZAC EVE PARTY! 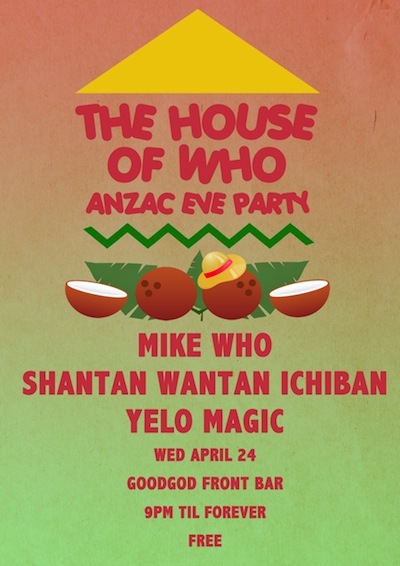 This ANZAC Day eve, Goodgod’s Front Bar becomes The House Of Who! An all-night jaunt through rap, carribean heaters, funk, and late night love jams. Mike Who is known as a man of many colours, holding down turntable duties on FBi’s award winning Stolen Records, regulating a bunch of parties across Sydney, as well as playing tunes from all corners of the globe.